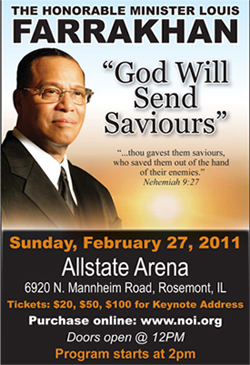 CHICAGO (FinalCall.com) - Excitement is building across the country as thousands prepare for the Nation of Islam's Saviours' Day 2011 Convention. This year's convention marks the 81st year of the Nation of Islam's existence in North America. Each year, to commemorate the birth of its founder Master W. Fard Muhammad, members from around the world make the journey to Chicago, Illinois during the last week of February for a time of fellowship, networking, information dissemination and spiritual renewal. “We are in anticipation of one of the greatest Saviours' Days in our history,” said Student Minister Ishmael Muhammad, son of the Honorable Elijah Muhammad, and Minister Farrakhan's assistant at the Nation of Islam's international headquarters Mosque Maryam in Chicago. Ademah Muhammad, the Nation of Islam's special events coordinator, told The Final Call the staff and laborers have been working non-stop to make Saviours' Day 2011 enjoyable for all ages and interests. “The Saviours' Day convention staff has been remarkably efficient. The staff has been working hard for the last seven months to get this together,” he added. This year, the workshops and plenary sessions are being held under a common theme: “A Scientific Analysis of the Teachings of the Honorable Elijah Muhammad.” Some of the best academic minds in their fields have come together for what is sure to be a Saviours' Day like no other. The morning plenary session features a wide-ranging discussion involving the controversial best-selling book The Secret Relationship Between Blacks and Jews, Volume 2 from the Nation of Islam's Historical Research Department. With recent snowstorms and cold temperatures blasting large portions of the U.S., and given the unpredictable nature of world events, experts in the area of disaster preparedness will discuss ways to make sure families have what is needed to overcome any challenges that could arise during times of emergency or instability. On Saturday, Feb. 26, the very informative morning plenary session deals with “How to Eat to Live: Heath and Well-Being of Humanity.” The Hon. Elijah Muhammad's words in How to Eat to Live, Book One and Two delivered groundbreaking dietary guidance acting as a catalyst for an entire generation of holistic health practitioners. With recent food contamination reported and escalating prices, his guidance is needed now more than ever. Related to that area, the pioneering agricultural work of Growing Power, Inc. will be on display. Demonstrations of the innovative food producing system utilizing the “hoop house” technique will be shown. Beyond the traditional greenhouses, the hoop house is essentially a low-cost greenhouse that can be constructed with commonly available materials. The recent sighting of an “Unidentified” Flying Object over the Dome of the Rock in Jerusalem has more people seeking real answers regarding what they actually are, how they operate, and their purpose. For decades, Minister Farrakhan has spoken openly regarding that which he was taught by the Hon. Elijah Muhammad regarding these flying objects. At the afternoon plenary session, renowned international scientists and researchers bring compelling, extraordinary evidence that will provide evidence and proof of what the Honorable Elijah Muhammad taught, removing any mysteries regarding their existence. “Last year he (Minister Farrakhan) told us that these UFOs or flying objects would be seen over the major cities,” said Student Minister Ishmael Muhammad. “There have been more and more sightings reported from around the world,” he added. All four plenary sessions are scheduled to be shown live via internet webcast at http://www.noi.org. “Given what is happening in the world and on our planet, the Minister's keynote address will be one of the most important messages that he has ever delivered,” said Student Minister Ishmael Muhammad. Among the displays shown during the four-day convention will be an historical museum which will include photos, books and clothing artifacts chronicling different phases of the development of the Nation of Islam and its contextual placement within the Black religious, cultural and socio-political experience of America. There will be an historic sightseeing bus tour that includes viewing many of the properties purchased by the Honorable Elijah Muhammad and owned by the Nation of Islam prior to his departure in 1975 and also a health fair in which health care professionals will be available to answer questions and conduct blood pressure readings, diabetes screenings and oral examinations. An annual favorite is Mother Khadijah Farrakhan's Children's Village, which is free for all children who register during Saviours' Day. As always, those children who attend will have an opportunity to have their pictures taken with the First Lady of the Nation of Islam. Additionally, dozens of entries from all across the United States were received for the first ever Saviours' Day 2011 Essay and Art Competition. The theme of the competition is “What Saviours' Day Means to Me.” The winners will be announced over the weekend and the work of the winners will be displayed in The Final Call. This year also marks the return of the incomparable drill competition. Drill teams from across the Nation of Islam will engage in righteous competition displaying the discipline and precision that is a hallmark of the Nation of Islam's Fruit of Islam and Muslim Girls' Training and General Civilization Class. There will be evening screenings of the documentary “The Black Line Profile of the African-American Man.” This film takes a look at the inner-thoughts of Black men from all walks of life, on a variety of topics affecting the Black community. A Jazz and R&B Show is scheduled for Friday, Feb. 25 and on Saturday, Feb. 26, a comedy show is scheduled, all taking place at the Stephens Convention Center. As always, the Salaam Expo vending section will be available throughout the entire conference with friendly hours and affordable deals on goods and services that you would have trouble finding anywhere else.